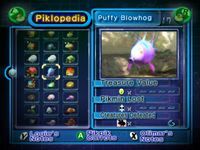 The Piklopedia, with the Olimar's notes button ( / ) visible at the bottom-right. When Captain Olimar sees a creature or feature of the planet's biology, he jots down some notes. His notes, unlike Louie's notes, are very informative and provide a lot of detail. Olimar speculates quite a lot, though that is natural due to the sheer strangeness of the life forms on the planet. He also appears to be quite the biologist, if one assumes that all of his notes are his honest opinions. This page was last edited on September 5, 2016, at 12:00.